My inspiration comes from life, people, places, and nature. You can see and purchase recent work at: www.chairish.com/shop/annecarrozzaremick Thank you! ​"Wonderful item + wonderful generous seller...Thanks so much!" "This is such a bright, cheerful painting. I love it! Thank you also for the fast shipping." "The drawing is fantastic and the extra personal touches that were included in the delivery make it clear that Anne is passionate about her work. Highly recommended!" "Love it! And - lovingly enjoyed daily." "The most generous and kind artist I've purchased from. The painting is beautiful! Thank you so much!" "Love it - the colors are beautiful :-) Thanks for the quick delivery and the correspondence throughout the process, Anne!" "LOVE Love love my new painting! Anne, has a wonderful artistic eye & keen sense of color!!!!" "Delighted with my purchase! The painting is perfect, with vibrant colors by a clearly talented artist. It's a wonderful addition to my poppy art collection. It was wrapped well and shipping was lightning fast. Next time I want to buy myself a present I will shop here again!" "Anne is a talented artist and a lovely seller. This fabulous drawing arrived super fast, well-packed, and with a charming note. The drawing is lyrical and beautiful, and I will enjoy it for years! 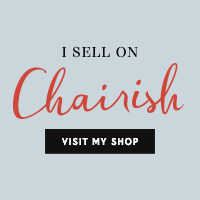 buying my work on Chairish.